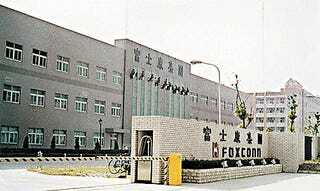 Foxconn is famous for two things: Manufacturing electronics (the PS3, the Nintendo Wii, the Xbox 360 and the iPhone) and having employees that commit suicide. This year, 12 Foxconn workers have taken their own lives. A 22-year-old female worker from Jiangsu Province has fallen to her death this week at the company's Kunshan factory. Foxconn has confirmed the incident, and police are investigating whether the death was accidental or intentional. If it was suicide, that would bring the total to 13 workers this year. The worker began working at Foxconn's Kunshan factory this past March. She fell into the safety nets surrounding the dormitory, but did not survive the fall. This year, a couple of workers have died due to accidents, including one who apparently died of overwork. Foxconn also accidentally poisoned 250 of its workers while spraying for insects. Foxconn says these suicides are unrelated to the work conditions at its factories. However, there have been reports of long hours and even mistreatment by management. The number of Foxconn suicides falls below the national average. At its Shenzhen plant, Foxconn has increased salaries from US$130 to $175 a month and has also offered a 66 percent performance-based raise. The increase in salaries has made Foxconn look to relocating plants to China's interior, where wages are lower. The company is also considering increasing automation in its production line and might have to increase the manufacturing fees it charges companies like Microsoft, Sony and Nintendo. Not to make light of this woman's death, but isn't it incredibly sad that Foxconn produces better game consoles than safety nets?